INMAN – Amari Bates scored 32 points and, just as importantly, hit five out of six free throws in the final 17 seconds of Clinton’s 67-61 upset of Chapman Tuesday night in the opening round of the Class 3A boys’ basketball playoffs. He missed the second, and Sam Tiller swooped across the lane to grab the rebound with the Red Devils leading 63-61. Tiller passed it out to Bates, who was fouled and hit two free throws to boost the edge to 65-61 with 13.8 seconds on the clock. Chapman missed, and Clinton needed three tries to get the ball in play, the first two being tapped out of bounds by Panther defenders. Bates took the ball, dribbled upcourt and was fouled with 1.3 seconds left. He hit them both. Final score: 67-61. Bates came in handy a third way. He took control when J.D. Payne, who scored 19, fouled out with 2:47 remaining. It all added up – Bates plus Bates plus Bates and coordinated assistance by his teammates – to a stunner in which Clinton (9-13), a fourth seed, bounced Chapman (15-11), a first seed. The Panthers, who defeated Clinton in the same gym, 79-73, on Nov. 28, entered the postseason as the champions of Region 2-3A. Tiller and Konnor Richardson were strong on the boards. As a team, the Red Devils hit 54.8 percent of their shots, though only five players scored. As a defense, they held Chapman to 37.5 shooting, though 10 players scored. “We are peaking at the right time,” Clinton head coach Eddie Romines said. “We’re playing our best basketball at the most important time of the year. Early in the season, other teams tried to take J.D. (Payne) out of the game. ‘Noodle’ (Bates’ nickname) has really come on. He had a great game. J.D. had a great game. Guys came off the bench to contribute. Sam (Tiller), Konnor (Richardson) get in the trenches, the paint, and do the dirty work. 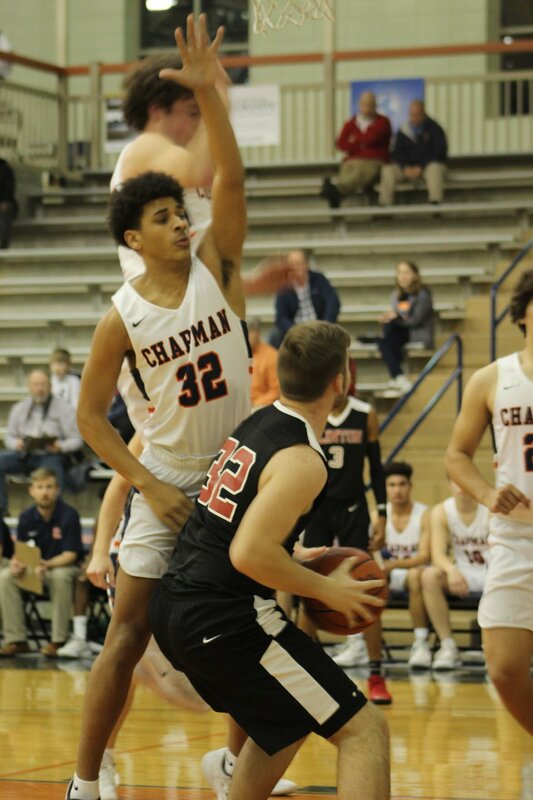 After Clinton pulled out to an 11-7 lead, Chapman put together the only concerted run of the game, scoring nine straight points to take a 16-11 lead. The Panthers led by four at the end of both the first two quarters. Clinton led narrowly for the majority of the second half, but the game’s biggest lead was the one the Red Devils had at the end. Clinton will visit Seneca, a 62-56 winner over Camden, on Friday night at 7. CLINTON (67): J.D. Payne 19, Amari Bates 32, P.J. Bluford 5, Sam Tiller 5, Konnor Richardson 6. Field goals: 23-42. Free throws: 11-20. Rebounds: 31. Turnovers: 15. CHAPMAN (61): Ke Anderson 10, Brandon Fortenberry-Smith 11, Dakota Wolford 3, JaKorie Gastwell 4, Mike Colasurdo 2, Andrew Colasurdo 6, Tyshun Porter 2, Aaron Moss 6, Albrey Gossett 6, Jalen Pearson 11. Field goals: 21-56. Free throws: 11-18. Rebounds: 31. Turnovers: 11.